Hey all, the Madrid Open Draw has just taken place at La Caja Mágica and after leaving it pretty late to announce his participation Federer is in there as the third seed. Madrid has historically been a pretty good tournament for Roger but since he last won there in 2012 he hasn't been past the third round; skipping it once and losing to Nishikori and Kyrgios on his other appearances. This time around the draw looks pretty tricky starting with either Nicholas Mahut or Joao Sousa in the first round. Mahut has no real business on clay so I imagine Sousa will be his second round opponent. Sousa has given quite a few of the top guys a tough time in matches I've seen, including Federer in Halle, so he's no pushover early doors. Sousa will prefer the balls coming through the air quick too in Madrid as he's a bit of a flashy shotmaker which means it could be an interesting match. Round 3 could then be against Dominic Thiem who has an impressive win against Nadal on clay on his resume. The Austrian is still playing in Munich as it stands, facing Zverev later today in the semi finals, so I'm not sure how he will fair in Madrid. I imagine he'll defeat Del Potro pretty easily as he isn't at the races yet but Paire or Sock are his 2nd round opponents and both like this surface. I'll go with Sock as Federer's third round opponent and I like Fed's chances in that matchup as he finds Sock's weaknesses too readily. Should Roger make the Quarter Finals then it's pretty likely Nadal would be the man on the other side of the net. Nadal's had a bit of a resurgence on the clay winning both Monte Carlo and Barcelona in impressive style. It's still a bit early to say he's the force he once was but his confidence is going to be way higher than it's been in recent months. Fed of course has one of his rare wins on clay against Nadal in Madrid but you'd be hard pushed to make him favourite in this one. Into the semis and the seeded opponent is the defending Champion Murray who has a pretty nice draw. A few guys in there capable of causing the upset like Dimitrov, Simon and Berdych but you'd fancy Murray to have enough to see them off. The final is then of course projected to be against Djokovic. Nishikori and Wawrinka are also in that half so it's not nailed on he'll make it. Kei's made the final in Madrid before so he's probably the one to watch. Thiem, regardless tiredness factor, It would be interesting match if they play each other. Yeah feels like I have hardly watched any tennis this year. Busy period coming up though. I don’t think Thiem is in great form past few weeks, dropping sets in a lot of matches. Madrid will be an interesting tournament this year, and I believe the winner will be the eventual winner for RG, despite who wins Rome. If Nadal wins it he always goes onto win Roland Garros. Does it feel as if nadal is back? He seems to have that confident swagger in his walk again. Fed won in 2012 and went on to win Wimby! fed wl lose to thiem in 3 sets thursday. thiem wl also bt nadal and reach the finals before bowing to nole. Thiem has a great game on clay but I think match up with Fed is going to cause him a lot of problems. I would back Fed to win should they meet. Thiem looks awesome when he’s ripping groundies and his opponent is 6 feet back but he will rarely play someone who plays like Fed – up the court, take time away. Thiem has big wind up on both wings, Fed always does well against that type of player by rushing them. Somehow I am not worried. Let it be. I do not think Nadal is gonna win a 3rd tourney in a row. I think his latest resurgence is largely due to not having to play a lot of the top guys. But you never know. Thiem is a threat. Let’s just get going and let Fed get a couple of good matches under his belt! Yeah Nadal hasn’t played Djokovic yet but he has dispatched a lot of the top 10. It would have been interesting if Thiem had converted those break points he had, but Nadal saving them on clay is the best in the business. I’m not expecting anything. Until his hair grows out some, that is! Is it just me or has Djokovic got an easy draw AGAIN. Not expecting Fed to get past Nadal. Fed has played 3 matches in 3 months and Nadal is on a roll. I don’t see Murray beating Nadal on clay either. Hopefully I’m wrong but not too excited about the clay season. Bring back the blue clay! Murray was on top in Monte Carlo but got worn down. If he can play aggressive then he has a chance I think but rarely sustains it. Tbh I think Muzz has an easier draw… HopingAlmagro gets on a roll and takes out Novak….. ? Why am I not surprised that it’s Roger that gets Rafa in the QFs? Assuming both of them get that far, of course. Yeah I think Fed will overtake him. Although Fed has Rome points to defend too so probably going to swing between them. Will be interesting to see if Murray can go deep at the French. too much with his lift as before……With Murray it will be an easy Job…..of course he might loose with Djokovic in the final.. I will be happy that he can move to the second place as Murray will loose points if he does not win in the final, which is pratically impossible……in any case Federer will win points for sure. It’s optimistic to think Federer isn’t going to struggle against Nadal on clay. I don’t think his attack or racquet are better, they are just better suited to how he needs to play to be competitive on the tour right now. If there’s a Fedal meeting I give Fed about a 20% chance of winning and that’s quite generous IMO. He is going to really struggle to put the ball away against Nadal here. Matchup and surface all in Nadal’s favour, it’s going to take a special performance I feel. Or a below par Nadal to show up which has never really been the case when the two have met. I would be pleasantly surprised if Fed gets to the QF. I think Thiem is a real threat, although he may be tired after playing the F in Munich. If Fed does meet Rafa, I can’t see Fed winning, given Rafa’s form of late. Rafa may not be at his very best, but pretty impressive all the same. I like the matchup for Fed with Thiem. Lot of things in his favour. Yep, it’s typical that Feds should now be meeting Nadal who appears to be on an upturn 😉 Thiem in final tomorrow so he *may* be tired, but still a tough one. Although obviously Djokovic’s a favourite anyway, I agree Sue, he DOES seem to strike lucky with the draws. Quick ish clay court, you have to think Fed will enjoy playing Thiem on this surface. As soon as he takes time away and Thiem is slicing I think Fed is taking control. Will be rushed like never before. I guess Del Potro can never be counted out but his backhand looks like it can only hit a rally ball these days. Any coach is going to tell their player make him hit 30 backhands in a row. I don’t think Fed has to beat Nadal to prove why he has a title as Roland Garros. He proved it by winning 7 matches, wasn’t like he got handed the title. Nadal and Djoker pre tournament favourites for me. Agree Kei the man to watch ( apart from Rafa). I think Thiem may struggle with the conditions, prefers slower clay with his big prep etc and I think he may be v tired… really overplayed… ? Yeah I think same about Thiem. Played a lot this year and he went the distance in Munich in a number of matches. Aargh, yet another obstacle. Can’t catch a break–first the knee injury, now a bad draw with a confident, in-form Nadal. Will be tough enough for Federer to get to the QFs, never mind winning. 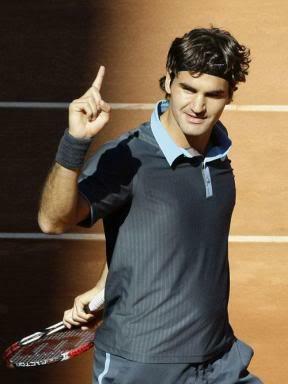 Only a 100% Federer stands a chance against Nadal. Still good to see he’s hungry to play more tennis. Looks like his body can take it too. There’s still Rome if he needs more match play–and he probably will, after this tournament. He’s done very poorly in Madrid since he last won in 2012, I don’t think the conditions suit him anymore. After the great blue clay experiment, they apparently changed the courts–they used to be torn up and relaid every year, now they’re installed permanently and people play on them year-round. Probably makes it a lot slower. I liked the blue clay, and not just ‘cuz Federer won–it was interesting to see players adapt to what was essentially a novel, one-of-a-kind surface. Still, no use crying over spilt milk. Steve: May I add “Only a 100% Federer AND A BELOW 80% NADAL stands a chance against Nadal”. That’s how poor his matchup against Rafa on clay is IMHO. Yeah I read something about that too, permanent courts now. Blue clay went wrong because they had a frost or something during installation and it effected the consistency which made it slippy. And I think there were complaints about the clay in Madrid anyway because it was a drop in type court even when it was red. They should do blue again, it made watching on TV way better. Nishikori has one brutal of a draw. Tough luck to him. Very difficult draw. Thiem is a brilliant player, but, similar to nishikori, he does struggle to take chances a lot. Fed only tends to lose when his opponent has two chances and takes both. I don’t think he would be troubled by the second round opposition. Am aware he’s lost early a fair bit before, but it’s usually someone with the danger weapons. The issue here, as usual, is Nadal. It would be optimistic to give fed any chance against Nadal right now, to be honest. For one thing, even at his best, he’s rarely solved nadal on clay. Obviously people here hate to hear it, but Madrid and Hamburg, both involved Nadal in a ridiculous physically demanding semi. If we (and let’s face it, we do) use the del Potro match for the Olympics as an excuse, Nadal gets his excuse too. Only other comment is the one people have echoed: Djokovic just does not get difficult draws. Nishikori could be a huge threat, and he’s always solid on this clay swing (not the French, of course). Gonna go safe and say Djokovic won’t bomb out two tournaments in a row, I could see him lose the final to fed or Nadal, maybe even Murray, but an early exit off the cards. I think the struggling to take chances is harsh for Thiem. He missed a lot of break points against Djoker and Nadal who are two of the best at saving them going so just one of those things. I can’t think of many other matches where he’s struggled? Looks very steady on the big points from what I seen. Probably played a part but I don’t think you can use the physically demanding excuse for Nadal much because that’s how he plays regardless of his opponent. He can look laboured playing someone 400 in the world and like he’s second best but then wins the set 6-4. I wasn’t really using it as an excuse, but however much Nadal grinds, it’s hard to argue that he doesn’t try to finish matches quickly. He just has never been someone who can quick fire an opponent. In reality, fair enough, that means he and the likes of Djokovic sacrifice their bodies for a more secure and stable winning style, but it isn’t as if Nadal goes into matches hoping they’re physically demanding. He just recognises that sometimes it’s the best way to win for him. Re your second bit, yeah, he can look very laboured. There’s no sportsman I’ve seen who makes winning look more like a burden than Nadal does. I think part of it is the intensity he brings though. For one thing, he isn’t as talented as federer, so tends to stick to similar high percentage patterns. For another, the grunting and screaming, the full on forehand swing and power game, they all feed through the impression of effort. I think that is illusion sometimes, as he is quite prone to winning quickly (he attacks a lot), but time between points makes it feel like he’s taking ages. One match don’t a conclusion maketh. But I like him and delpo, so didn’t mind who went through. Did you watch it Jon? I think there’s another stat based on X previous matches. Didn’t look great. But least he’s creating them I guess. Didn’t see any, pretty big win for Del Po. Although Thiem has played loads this year. Should try save some for the French. When is Fed’s first match??? Anyway: I just watched Munich’s final. It was a very good match indeed between two nice guys and good players. Not too many errors; both Kohlschreiber and Thiem played aggressively and made a few very smart shots. TB in sets 1 and 3. Thiem showed lots of guts and focus when he needed to dig himself out of trouble (he saved a lot of SP and at least 2 MP), but overall Kohli was just that bit more solid. That said, Fed is in for a tough time should he meet Thiem. Yeah I watched some live and extended highlights, it was a good match. I like both guys but wanted Kohli to bag a title on home turf. What the hell happened to Dimitrov today…total meltdown? Good on Kohli for winning. I was wondering where he went tennis wise. And good on Almagro. Yes! And out of 2 finals, two victories for one-hand BH veterans. The Estoril final was more like a baseline grind fest (surprise, surprise, between two spaniards). Damn, those dudes hit the ball really hard. Almagro did very well, in spite of giving away set 1 after serving twice for it and then wasting 4(!) consecutive setpoints in the TB. This guy has been in and out of the game, which is a bit of a shame because he’s reached #9 a few years back, so he’s no hodman! Did you go watch in Oeiras Rui? Almagro is a decent clay courter. I like how sort of languid he is with game style, looks like he’s just chilling out hitting a few shots. No, not this year. Anyway, they changed the site. Before it was in Oeiras, yes, now it’s actually in Estoril, so the tournament’s name finally matches the county where it’s held! Oeiras was way more relaxed and more directed to the people genuinely interested in the sport. You could even buy gear and have your tool restrung. Back to what really matters, that languid style is typical of guys with that natural skill that makes it all look so damn easy, a bit like a certaing swiss bloke and, fortunately, a few more. @Sue Dimitrov smashed up some racquets and got a game penalty to lose. Bit of a joke really as it prevented Schwartzman from closing it out himself which he’d have done. But the scorebook says 6-0, that’s all anyone will remember in a few years. Decent title for the Argentine, he has a good game. Nadal’s resurgence really caught me by surprise, and I’m still waiting for someone to share an analysis of it. It’s most curious to me that he seems to have reverse his physical decline and showed better stamina. It’s quite incredible if he wasn’t on something. I watched the first set of Barcelona final and he looked pretty ordinary. He had a lot of luck to take the first set. Nishikori looked a much better player. I really don’t know how he managed to win those two titles. Nadal is at home on clay, he won by making his opponent playing one more ball time and time again plus used his forehand to pretty good effect. Grinds his opponents down like nobody before. Who knows about PED’s. Always lot of suspicion around him. Especially when PEDS have the biggest effect on athletes training blocks as they can really push the limits and that translates to a higher level on court when they compete. If they have to stop taking them for whatever reason (caught, they know drugs testing is being upped etc), then their training regimes suffer as they no longer know what they are capable of without getting injured. Competitive level on court then drops. Pretty similar to Nadal 😆 so no real surprise that many have him down as a doper. But Nadal is always home on clay. How does it explain his poor form in the past couple of years, or last year specifically, even on clay? Or maybe he just had a bad year and he’s now woken up. You’re right John. I read an article some where that Nadal actually has faced more bps this year so far than last year but he’s been able save more. He’s also created more bps on his opponents serves. One only needs to go as far as Thiem in MC and Nishikori in Barcelona to see how many bps Nadal saved. How he was able to do that. I don’t know. Federer withdraws from Madrid due to back injury. Says he does not want to take any risks. The injury is not as severe as it was before the 2014 Davis Cup final. Hopes to play Rome! Get well soon Fed. I strongly believe it is a very sensible decision after what he went through in 2013. He risked by playing Humberg and Gastaad, and paid the price. With an extended grass court season ahead where he can reap the harvest in his favourite ground, this is the correct decision. Hopefully he will come back fresher and stronger! I don’t think Fed needs another Nadal loss to get ready for Wimby. I think he can make it up somewhere else. If Fed wants the match experience all power to him, but for myself, I hope they don’t meet here – one way or the other. Nadal is on upswing. Fed is still clearing out the cobwebs. Especially on clay, the match up will be and boring and predictable and painful. Not a problem now Alb as he won’t be playing. WHAO. Fed out with back injury!